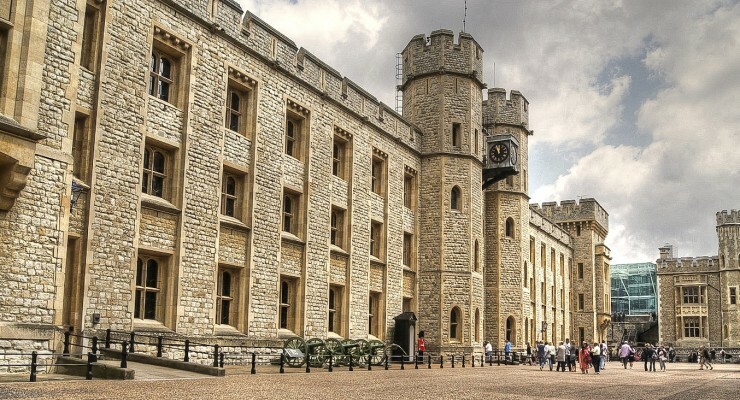 Her Majesty’s Royal Palace and Fortress, more commonly known as the Tower of London, is a historic castle on the north bank of the River Thames in central London, England, United Kingdom. It lies within the London Borough of Tower Hamlets, separated from the eastern edge of the square mile of the City of London by the open space known as Tower Hill. It was founded towards the end of 1066 as part of the Norman Conquest of England. The White Tower, which gives the entire castle its name, was built by William the Conqueror in 1078, and was a resented symbol of oppression, inflicted upon London by the new ruling elite. The castle was used as a prison since at least 1100, although that was not its primary purpose. A grand palace early in its history, it served as a royal residence. As a whole, the Tower is a complex of several buildings set within two concentric rings of defensive walls and a moat. There were several phases of expansion, mainly under Kings Richard the Lionheart, Henry III, and Edward I in the 12th and 13th centuries. The general layout established by the late 13th century remains despite later activity on the site. Copyright © 2019 Metropolis Theme Demo.